Participants in this weekend intensive will be introduced to the world of beautiful, accessible, and sustainable botanical dyes. Learn the basics of selecting and preparing fibers, extracting color from a variety of plant materials, and fixing natural dyes to fabric. We’ll discuss the history of natural dye use, and explore some contemporary applications of pattern. You may bring along natural fiber materials you wish to experiment with in the dye pot. Join visiting artist Natalie Stopka to create botanical works of art featuring common garden flowers and herbs. We’ll practice the technique of hapa zome, also known as plant pounding, and then pattern silk fabric handkerchiefs with the colors and forms of nature through bundle dyeing. Reveal the wealth of color hidden in common dye plants such as coreopsis, marigold, and hollyhock in these simple processes that are ecologically friendly and aromatheraputic ways to explore botanical color! Suminagashi is the Japanese art of marbling by floating ink on the surface of water. In this one-day intensive students learn the basics of this centuries-old monoprint technique, including the tools and materials it requires and the ideology shaping suminagashi practice up to the present. Students will develop a suite of patterns on paper and fabric using the natural forces of wind, vibration, and chemical interaction. Small studies will be expanded upon in our large 4x4’ marbling vat, where students will have the opportunity to print yardage with their unique patterns! This week I'm testing botanically derived pigments on paper, and looking forward to pushing my craft into unknown territory! Shibori is the Japanese craft of patterning fabric with the resist techniques of wringing, pressing, or cinching. After dyeing in an indigo vat, fabrics retain the visual memory of each little pleat, pinch, and stitch in their patterning. In this one-day workshop we’ll mix up an indigo vat and use it to follow the development of shibori patterns through history, creating an array of swatches. After learning the basic language of mark making, students will be free to experiment with patterns of their own. Focusing on plant derived natural indigo, participants in this intensive workshop will prepare two organic indigo vats for dyeing both protein and cellulose fibers. We will create an array of swatches and explore resist dyeing techniques reliant on the particular working qualities of indigo. Fabric will be provided, but you may bring along materials you wish to experiment with in the dye pot! No previous experience required. Registration for early spring workshops is now open! I'll be hitting the road in 2017, with new course offerings at Snow Farm in Massachusetts and Peters Valley in New Jersey. These immersive programs give us the time to really get our hands dirty, and students can take advantage of studio access outside of class time. Looking forward to meeting new friends and craftspeople there! Check out the full lineup here. Participants in this two day intensive will be introduced to the world of beautiful, accessible, and sustainable botanical dyes. Learn the basics of selecting and preparing fibers, extracting color from a variety of plant materials, and fixing natural dyes to fabric. We’ll discuss the history of natural dye use, and explore some contemporary applications of pattern. If you'd like tobring items made from natural fiber fabric you will have the opportunity to experiment with them in the dye pot. No previous experience required. 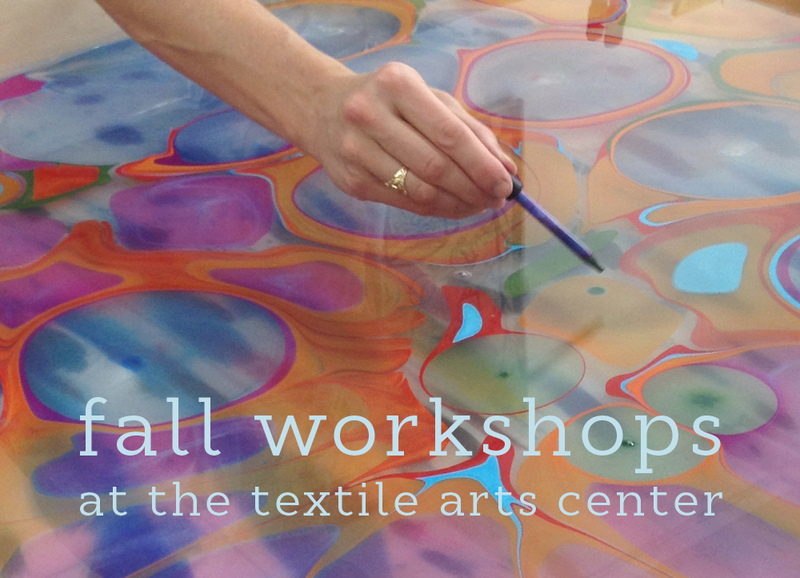 Delve into the broad world of fabric marbling! Uncover the secrets of Japanese suminagashi, then explore the colorful world of Western-style pattern making. Topics include the history and ideology behind each technique and how to select fabrics, prepare a marbling vat, and create permanent prints. Once familiar with the process, students can develop their own style to print two silk scarves. All welcome. Developed in 4th century Egypt, Coptic books have beautiful linked stitches that stretch across the spine and open flat, perfect for a sketchbook or journal. Each student will complete the binding of a book in class. All levels of experience welcome! Students are invited but not required to bring decorative papers they would like to use for their book's cover. Fall workshops are now open for registration! You can check them out here, or register directly.